Multiversity is here! Morrison is back! And there’s a lot going on! A LOT! Now I’m sure most people are going to praise this book because of Morrison’s reputation, the impact he’s made on comics, and/or the fact that he’s doing something different with this book… But that’s not going to earn my praise. Grant is human. He has highs and lows. And “different” isn’t always good. As I said, there’s a lot going on in this book, so I’m going to do my best to make sure I catch everything, but if you notice a connection I missed, or something you feel is critical or noteworthy, then call it out in the comments. I was excited to read this, so last night I was anxiously waiting for midnight. At 12:08, my pre-order still hadn’t come through on my iPad, so I was refreshing like a madman until it downloaded. I finally got it, and dived into Multiversity. This is going to be a crazy ride. Right away, I was on-board! The prologue preached of life flourishing and prospering in all circumstances, no matter the when, where, or how. The whole thing is done in a very Terrence Malick-esque presentation, showing the separation yet similarity of all life: mites living on lice. Lice living on humans. Humans living in a city on one of the many Earths. This particular human – the one with lice – is trying to collect rent from one of her tenants. The tenant is Uotan, one of the characters we will follow for this issue. He’s received a DC comic that is supposed to be haunted, and will haunt those that read it. As he flips through the comic, the comic shows his landlord knocking to collect rent… Mind blown. I’m even more interested in this book now! During this whole opening, there’s a narration/ internal thought/ dialogue from an outside source (it’s unclear which of these it is during the moment) that plays on the situation at hand, and toys with the fabrics of reality and existence. Uotan begins to question whether the comic can actually be haunted, as he has a conversation with Mr. Stubbs… A talking, pirate monkey. Yes, he’s a monkey that talks, and dresses as a pirate. I process this, accept it, and turn the page only to discover that Uotan is Superjudge – the last of the Monitors, a group of god-like beings that vow to protect the Multiverse. I was a little confused whether this was a daydream, or reality, but then I saw him all “Superjudged” out, flipping through the comic… so, reality. He decides that he needs to stop the distribution of the comic, to prevent the evil inside it from being unleashed. So along with Mr. Stubbs the Pirate Monkey, Superjudge decides to travel to Earth-7, where the comic came from. Earth 7 is completely destroyed, with fallen, decrepit buildings, and bodies scattered throughout the rubble. Superjudge and Stubbs stumble onto the Thunderer, an aboriginal lift of Thor, who appears to be the only living survivor of Earth 7. He’s badly beaten from the Gentry, the spirit(s) or being(s) that are attacking the Earth to cause its inhabitants to abandon hope and become like them/it. Thunderer notices Uotan, and warns him to flee, before the Gentry threatens to kill Thunderer. The only pardon for Thunderer would be a trade for Uotan. Being the last Monitor, and protector of the Multiverse, Uotan agrees to the trade, sending Thunderer to his ship to escape. It’s during this encounter that we discover that the narration/internal thought/ dialogue from an outside source was actually the Gentry, calling out to Uotan. At this point, I’m definitely still in the game, however I’m starting to absorb Morrison’s wacky randomness more slowly. As Uotan stays behind to face the Gentry, the book suddenly jumps back to Uotan’s apartment, with him in normal clothes, having a minor wig-out, dropping the comic book and a bottle of pills. Ok, now I’m slightly confused, and trying to wrap my head around what is actually happening. Is Uotan delusional, a pill popper, or is really Superjudge and just mentally projecting himself to face the threat… I’m not entirely sure. I also want to point at that at this moment, we are only on page 15 of a 41 page book. The book then jumps to Earth-23 where we meet Superman. The transition to Earth-23 feels like quite the jolt, and isn’t very smooth. Quite honestly, it feels like it’s a completely different issue, of a completely different book. The story just picks-up on another world, with another story, as we get a glimpse into this Superman’s personal life. We eventually get to meet the Justice League of this Earth, as they investigate a robot carcass that is assembled with parts unknown to their world. It’s during this investigation that something happens to the Earth-23 Superman, which kind of starts putting the pieces together for this book. Unfortunately, the rest of the book just feels like it’s a collection of scenes slapped together. None of it feels like a cohesive story, as we move from one scene to the next, introducing/debuting characters like Captain Carrot – who I’m a fan of – and jumping to more Earths. While I do think Morrison writes really strong characters – and he definitely does so here, as a whole, Multiversity just feels messy. 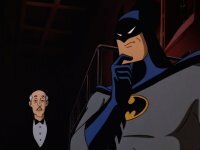 The book does close by circling back to cover some of the themes introduced at the beginning of the issue, and reveals a plot that may, or may not be considered predictable to help set-up the rest of the series. You’re a Morrison fanboy and read all his works. You love the idea of alternate universes, how they’re different, and how they’re connected to one another. You love big, epic, throw in everything, including the kitchen sink types of stories. Now for the juicy goodness. Be warned, spoilers exist below. The Good: As I stated, I loved the opening because it really felt like Morrison took a well through approach into setting this story up by providing a foundation and theme of what this story will be. There characters are also top notch! This is something that Morrison does REALLY well and I wouldn’t mind seeing some of these characters in other titles. While I mentioned liking Captain Carrot, I also enjoyed Red Racer, and the debuts of DinoCop and the Harbinger. The other thing worth noting is the art. I wouldn’t say that Reis’ art was incredibly amazing, but it was consistently good. What I’m really impressed with, is his ability to create worlds and characters that are so different from one another, and he appears to do it with ease. Morrison’s storytelling was definitely aided by Reis’ ability to convey the over-the-top events that were taking place. And as a comic nerd, I couldn’t help but appreciate all of the homages to comics that were in this book. The Bad: Multiversity felt like it was all over the place. The story jerked and jolted form one scene to the next, all while developing numerous questions that instead of aiding to the story, partially distracted you from the story. I know Morrison is trying to squeeze a lot into a short series, but sometimes it’s really important to make cuts, sacrifice some details and whims, and edit the story down. Overall: Morrison delivers a bold, complex and layered story that is over-the-top and grounded all at the same time. When Morrison shines, he really shines. Unfortunately, his storytelling is unfocused, and reminiscent of a kid in a candy store, with too many ideas to fit in one plot.